Fast forward to the 21st century, and this technology has been cost reduced and simplified to the point where it’s available for home use. 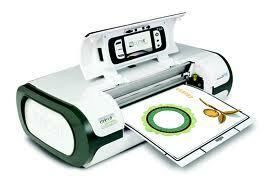 One company in particular, Cricut, has developed products that are safe and easy for children to use. While not as robust as a true CNC machine, these desktop-sized devices can cut thin metal foil, vinyl, felt or paper into an amazingly creative application of shapes and sizes up to one-half inch thick. These “consumables ” are relatively inexpensive, with packs of 35 vinyl sheets for around $30. The design process starts with cartridges which are factory loaded with templates for designs. These are typically themed (e.g., Food , Animals , Celebrations , Starter Bundles ) and there are multiple different cartridges with each them. Inserting the cartridge into the Cricut Machine, a shape is selected an cut from the material. It’s possible to load multiple shapes to create a unique pattern. For the more ambitious design, Cricut also offers an CAD (Computer Aided Design) type program where shapes can be edited and downloaded to the Cricut Machine.